Model Name: Datejust "Joyeria Riviera"
Preserved in spectacular condition, this early Datejust was retailed by the jeweler Joyeria Riviera. In business since 1943 and based in Havana, Cuba, the famous shop has had the privilege of stamping their name on vintage Rolex watches, ranging from Killys, to Datejusts and even early chronograph models. 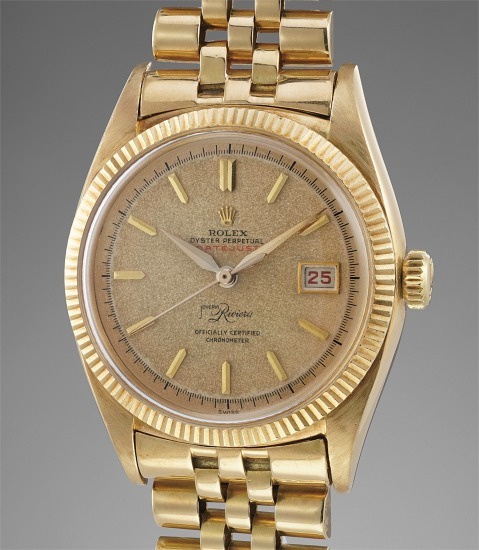 Early Datejusts most notably featured a reeded bezel and this timepiece is no exception. This case is preserved in excellent condition. So pristine is this watch that the inside caseback does not display any service markings. Still retaining its original crown, this watch displays a crisp and legible hallmark beneath the lugs. The Jubilee bracelet is from the period and stamped for 1955. Displaying non luminous hands and non luminous hour marks, the dial is equally remarkable. It has taken on a light layer of patina over time, which gives the watch so much charm and charisma. The red Datejust accents and date wheel are characteristic of Datejusts from the 1950s and are correct for the serial number.